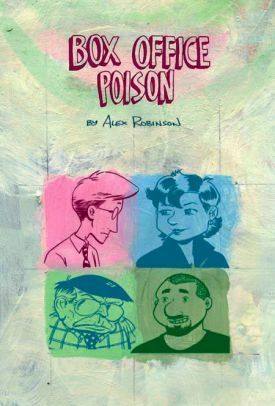 Box Office Poison is an in depth personal look into the lives of a group of friends, lovers and room mates. The novel takes place over the course of about ten months on the streets of New York City. Readers are given a front row seat as the cast of six main characters take us through the dialog driven story line. Together or apart the main characters must reconcile the past with the present as they journey into the next stage of adulthood. Truthful and emotional story telling through the voices of the characters. Light at times without being overly outrageous. Most of what happens in the book seems to be though personal discovery and growth. At first what seems like a random set of events turns at the mid point into a character driven drama once the stage is set. Conflicts are created and resolved some times from one page to the next while others build until the end of the book. The author does not leave a single stone unturned as he illustrates the personality and motivations of every character. The visual style of the book is perfectly balanced with the story line. In numerous places in the story the complexity of the illustration allows for the wordless conveyance of important dialog. Readers are constantly being rewarded by richly illustrated backdrops and extras. Every panel flows seamlessly into the next to provide an excellent flow and pace to book. Visually this is one of the most polished works I have ever seen. This graphic novel is definitely one of the most rewarding pieces from the genre. With a story and illustrations that take the reader on a journey through different moods and emotions, every page provides entertainment. The plot is very personalized to the individual characters and settings I found myself emotionally invested if not connected to the overall story line. Although it seemed to end abruptly after six hundred pages, the ending was very satisfying and complete. This book is a must read for anyone who doesn't believe that a story must feature good triumphing over evil.